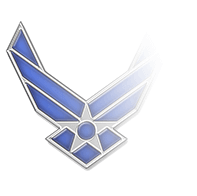 Until 2002, the rank of Chief Warrant Officer 4 was the highest position in the Navy’s Warrant Officer Cadre, and it still remains the ultimate achievement for a Coast Guard Warrant Officer (aside from seeking entry into Officer Candidate School). 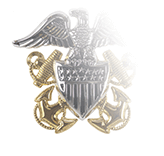 The collar grade insignia consists of two silver bars on a silver-framed, blue enamel background, reflecting the bifurcated design scheme chosen by the Navy for its CWO2 to CWO4 insignia: silver bars outrank gold bars, and two bars outrank one. 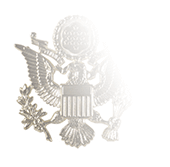 (For the CWO5 insignia, the Navy employs a single thin, blue bar on a silver background). 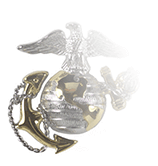 A Navy CWO4 wears collar grade insignia on the right collar point of the khaki shirt, while the left collar point it reserved for the CWO specialty (Intelligence Specialist, Cryptologic Technician, etc.). The Coast Guard uses the same system, but the uniforms that require collar grade insignia include the Winter Dress Blue and the Service Dress Blue (when jacket is not worn). 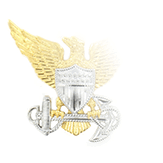 Both the Navy and Coast Guard issue Garrison Caps, and the same CWO4 insignia of grade used for collars is worn on the right side of the caps and, just as with the collars, the CWO specialty mark is worn on the left.